Kobelco further expands dealer network in Germany - Kobelco Construction Machinery Europe B.V.
ALMERE, August 20, 2014 – Kobelco Construction Machinery Europe B.V. (KCME) is continuing its fast, yet controlled European dealer network expansion with the appointment of F.R. Baumaschinen GmbH. A recently signed agreement between the two companies further extends KCME’s growing network in Germany. F.R. Baumaschinen GmbH joins an already established German network, which includes EMB Baumaschinen GmbH, KARI Baumaschinen GmbH and Herbers Baumaschinen GmbH & Co. KG. 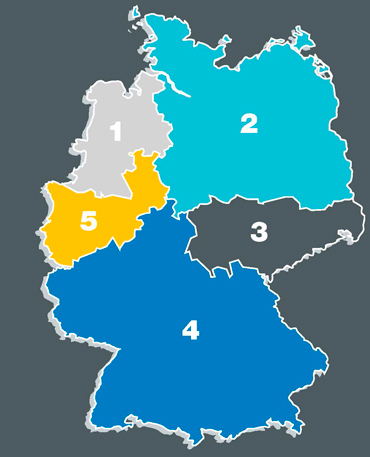 The German KCME dealer coverage is split into four different areas (illustrated on the map below) with a fifth Open Territory, which is currently available to new dealer partners. For enquiries about the Open Territory, please contact KCME on +31 36 2020 300. Makoto Kato, Managing Director of Kobelco Construction Machinery Europe B.V. said of the recent expansion: “Germany is a strategic and very important market for Kobelco. German customers expect technically advanced, high quality products. Reliability, fuel efficiency and low noise levels are also key factors. Kobelco excavators are well-regarded for all of these aspects. We are confident our products and dedicated network meet the German customer requirements”. The ongoing European dealer appointments highlight KCME’s commitment to support Kobelco customers, by working with dedicated dealers who have specialist knowledge of their individual markets. The partnership approach results in better advice regarding product and applications, leading to even higher levels of service and aftersales support. Kobelco enthusiasts planning to visit Steinexpo, Nordbau or Galabau can find out more about our advanced technology and customer solutions by stopping at the dealer stand at one of the exhibitions. Kobelco Construction Machinery Europe B.V. is wholly owned by Kobelco Construction Machinery Co., Ltd. Japan. The European Headquarters were re-established in Almere, The Netherlands in 2013 and include the sales and marketing function for Europe, Middle East, Africa and Russia-CIS as well as a parts warehouse to support aftersales service across the region.